In the management of neurological diseases, the identification and quantification of axonal damage could allow for the improvement of diagnostic accuracy and prognostic assessment. Neurofilament light chain (NfL) is a neuronal cytoplasmic protein highly expressed in large calibre myelinated axons. Its levels increase in cerebrospinal fluid (CSF) and blood proportionally to the degree of axonal damage in a variety of neurological disorders, including inflammatory, neurodegenerative, traumatic and cerebrovascular diseases. New immunoassays able to detect biomarkers at ultralow levels have allowed for the measurement of NfL in blood, thus making it possible to easily and repeatedly measure NfL for monitoring diseases’ courses. Evidence that both CSF and blood NfL may serve as diagnostic, prognostic and monitoring biomarkers in neurological diseases is progressively increasing, and NfL is one of the most promising biomarkers to be used in clinical and research setting in the next future. Here we review the most important results on CSF and blood NfL and we discuss its potential applications and future directions. In the management of neurological diseases, there is a compelling need for reliable biomarkers that can improve the accuracy of differential diagnosis and of prognostic assessment as well as predict the response to treatments. This applies to central nervous system (CNS) disorders of all causes, including inflammatory, neurodegenerative, traumatic and vascular diseases. Another application for biomarkers in neurological diseases could be to identify or rule out the presence of neurodegenerative processes, which would be useful for subsequent clinical management. In CNS and peripheral nervous system diseases associated with axonal injury or degeneration, the concentration of neurofilament light chain (NfL) has been found to increase in cerebrospinal fluid (CSF) and blood.1 [S1] Over the last two decades, an increasing number of studies have shown that NfL levels in the CSF and blood are altered in CNS diseases and are correlated with the disease characteristics. Furthermore, as a quantitative measure of the ongoing axonal injury, the increase in NfL levels could have a prognostic value in a variety of neurological diseases. Since it is feasible to measure NfL concentration in the blood, it may be a promising biomarker for monitoring the disease course in CNS disorders and, ideally, for evaluating patients’ response to treatments. In this paper, we provide a brief overview of the structure, function and mechanisms of release of NfL, and the methods by which NfL concentration can be measured. We then review its potential diagnostic and prognostic value in a variety of CNS diseases, as well as its usefulness in monitoring response to treatment, and we discuss how NfL could be applied in clinical practice. 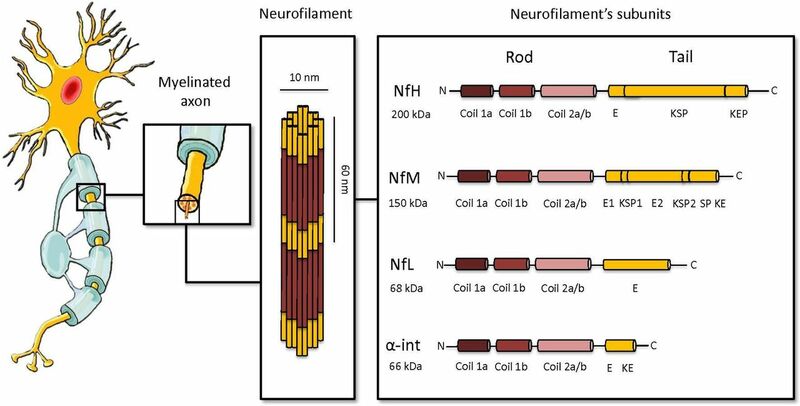 Overview of the structure of neurofilaments and neurofilament light chain. Large calibre myelinated axons abundantly express neurofilaments (Nfs). Nfs are cylindrical structures of 10 nm calibre and they are exclusively located in neurons. They confer structural stability to the axons, enable the radial growth of the myelinated axons and expand their calibre thus allowing a higher conduction velocity. Nfs are classified as intermediate filaments (IF), that is, as filaments with an intermediate diameter (10 nm) between actin (6 nm) and myosin (15 nm). In the central nervous system (CNS), Nfs are made of neurofilament light chain (NfL), neurofilament middle chain (NfM), neurofilament heavy chain (NfH) and α-internexin (α-int). All of these subunits have a conserved α-helical rod domain with a variable amino-terminal and carboxy-terminal region. The length of these latter confers a different molecular weight. NfH has the highest molecular weight and presents, in its tail, a glutamic-acid-rich segment (E segment), multiple lysine-serine-proline (KSP) repeats that are phosphorylated and a lysine-glutamic acid-proline (KEP) segment. NfM has a shorter tail with two glutamic-acid-rich segments (E1 and E2 segments), two KSP repeat segments and a serine-proline (SP) and lysine-glutamic acid (KE) segment. The tail of NfL is made of the glutamic-acid-rich segment (E segment). Finally, α-int has, in its tail, an E segment and a KE segment. The concentration of NfL in CSF is higher in patients with neurological diseases than in HCs (figure 2), and recently, similar findings have been reported for blood NfL too. The role of NfL as a biomarker has been largely reported in multiple sclerosis (MS), Alzheimer’s disease (AD), frontotemporal dementia (FTD), ALS, atypical parkinsonian disorders (APD) and traumatic brain injury (TBI). At a lesser extent, NfL has been studied in Creutzfeldt-Jakob disease and neurological complications of HIV infection, where it reaches very high concentration in the CSF (figure 2), in Huntington’s disease (HD) and in normal pressure hydrocephalus (NPH). The increase of cerebrospinal fluid neurofilament light chain in a variety of neurological diseases associated with axonal damage. The figure shows the increase of cerebrospinal fluid (CSF) neurofilament light chain (NfL) with respect to healthy controls (HC) in a variety of central nervous system (CNS) diseases. Columns represent mean fold increases and SEM of CSF NfL in neurological diseases versus HCs. Columns in red illustrate CNS diseases with mean fold increase of CSF NfL ≥10, columns in blue CNS diseases with mean fold increase between 2 and 10 and columns in grey CNS diseases with mean fold increase <2. Mean and SEM values have been calculated based on the values of CSF NfL reported in papers in which patients with CNS diseases were compared with age-matched HCs. For this figure, studies published within January 2019 were selected. The specific reference list is reported in the online supplementary material. AD, Alzheimer’s disease (it includes both prodromal AD and dementia due to AD); ALS, amyotrophic lateral sclerosis; CBD, corticobasal degeneration; CJD, Creutzfeldt-Jakob disease; CSF, cerebrospinal fluid; DLB, dementia with Lewy bodies; FTD, frontotemporal dementia; HAD, HIV-associated dementia; Mild TBI, mild traumatic brain injury; MS, multiple sclerosis (it includes clinically isolated syndrome, relapsing-remitting multiple sclerosis, primary progressive multiple sclerosis and secondary progressive multiple sclerosis); MSA, multiple system atrophy; NfL, neurofilament light chain; NPH, normal pressure hydrocephalus; PD, Parkinson’s disease; PDD, Parkinson’s disease dementia; PSP, progressive supranuclear palsy. Since NfL is a sensitive but unspecific marker of axonal injury, its potential diagnostic value does not lie in the ability to discriminate between neurological diseases characterised by a similar degree of axonal loss, but rather, between CNS diseases with a different degree of large myelinated axon damage and/or with a different progression rate or disease intensity, or between neurodegenerative and non-neurodegenerative diseases. For these reasons, the potential diagnostic role of NfL in the clinical setting should be complemented with other neurological assessments, as well as more disease-specific biomarkers and brain imaging findings. The lack of disease specificity and anatomical characterisation of NfL indicates that its CSF and blood measurement cannot replace MRI in the diagnosis of MS and CIS and in the exclusion of MS mimics. Nevertheless, NfL measurement during the diagnostic workup of patients with CIS and MS may still be useful for predicting disease prognosis, as discussed above and in the section on NfL in the monitoring and prognostic evaluation of MS. In terms of the potential clinical applications of CSF or serum NfL, the differences between patients with AD or FTD and HCs imply that this biomarker may help in the differential diagnosis between neurodegenerative dementias and non-neurodegenerative disease mimics (ie, depression).1 For instance, it could be difficult to distinguish between the behavioural variant of FTD (bvFTD) and psychiatric disorders in cases where neuroimaging does not reveal frontotemporal atrophy or hypometabolism. In such cases, CSF NfL can help in distinguishing FTD from psychiatric diseases with excellent accuracy (AUC=0.93, 95% CI 0.85 to 1.00, p<0.001). [S17] Although this finding needs to be confirmed with further investigations, it implies that NfL could be used to rule out neurodegenerative diseases in patients with psychiatric disturbances. In addition, it would be interesting to investigate whether CSF and blood NfL can be used to identify patients with neurodegenerative diseases among individuals with subjective memory complaints; this could guide clinicians to further proceed with the diagnostic workup. In this sense, CSF or blood NfL measurement may be useful as a first-line test, that is, as a screening test, for AD and other neurodegenerative diseases. While NfL changes in CSF might be more sensitive in identifying a neurodegenerative process in its earliest stages, blood NfL measurement would be more feasible as a screening test, due to its lower invasiveness. Of note, in asymptomatic ALS mutation carriers, no difference has been found in CSF NfL values compared with HCs, while a sharp increase of CSF NfL was described in symptomatic ALS mutation carriers, thus suggesting that, in these patients, NfL could also serve as a marker of disease onset.22 In these patients, when longitudinally assessing serum NfL, elevated levels were found in asymptomatic ALS mutation carriers who later developed ALS as far back as 11.6 months before phenoconversion. In addition, serum NfL levels continued to increase in the first 6 months after symptom onset. On the contrary, in patients with ALS serum NfL were found to be substantially stable over a median time of 1 year.23 These results suggest that neurodegeneration in ALS probably begins almost 1 year before the appearance of clinical manifestations and that serum NfL might be used as a biomarker for the early identification of neurodegeneration, with hopefully positive implications for patient selection in clinical trials on neuroprotective therapies in ALS. Among the subunits of Nfs, pNfH has shown to be present in increased concentrations in the CSF of patients with ALS, and it has shown excellent accuracy in differentiating between early symptomatic ALS and ALS mimics (AUC=0.98, 95% CI 0.95 to 1.00).19 So far, very few data are available on the serum pNfH concentrations in ALS. [S19] The current diagnostic criteria for ALS are based on the extent of upper (UMN) and lower motor neuron (LMN) involvement. 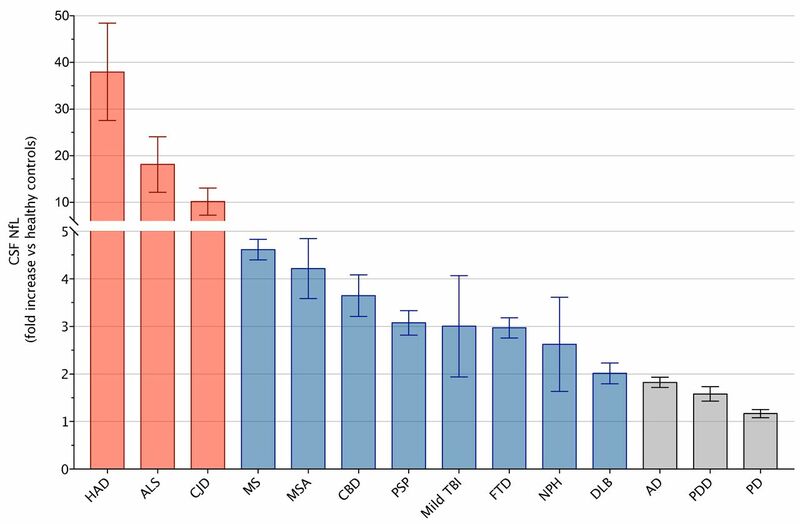 [S20] Since both CSF NfL and pNfH are significantly correlated with the number of regions with both UMN and LMN involvement,3 their use may enable early diagnosis of ALS. In conclusion, CSF and serum NfL have shown excellent diagnostic accuracy for ALS, even in the early phases of the disease. These promising results call for assay standardisation and validation, as discussed further below, before NfL could be used in the clinical practice. In conclusion, either CSF or blood NfL could be useful for the differential diagnosis of PD and APDs. Since evidence for the diagnostic value of NfL can be found only in studies performed on patients with an established diagnosis, CSF or blood NfL would be more appropriate as a supplementary measurement to help movement disorder specialists in the differential diagnosis between PD and APDs. Based on the findings so far, it seems that further studies are required to define the dynamics of blood NfL after a head trauma and, therefore, the best timing for its measurement. It is also not clear whether NfL measurement would be beneficial for the comprehensive management of TBI. [S24] A potential clinical utility of this biomarker would be to help clinicians in deciding whether a patient with TBI has to undergo a head CT or MRI. In one study, it has been shown that blood NfL can be used to accurately identify patients with abnormal head CT findings after a head trauma (AUC=0.84, 95% CI 0.77 to 0.92).35 Further investigations in which different diagnostic modalities (ie, blood NfL, electroencephalography and head CT or MRI scan) are compared are therefore recommended. There would be two prognostic uses of NfL: as a baseline measure at disease onset or diagnosis, and as a longitudinal and repetitive measure. Its repeated measurement may be applicable to patient monitoring in clinical practice as well as in clinical trials. The ability of NfL to reflect the degree of axonal damage makes it a reliable marker of disease intensity and/or activity across a range of CNS diseases. [S2] The potential correlation of both CSF and blood NfL with specific disease characteristics has been widely investigated (table 1). Furthermore, the potential value of baseline and/or longitudinal measurements of CSF and blood NfL in predicting the course of different neurological diseases, that is, MS, AD, FTD, ALS, APDs and TBI, has also been verified. NfL levels in both CSF and blood have been shown to be additional independent prognostic factors in a variety of neurological disorders, thus confirming their potential to contribute to existing prognostic factors. MS monitoring is nowadays largely dependent on serial MRI, but this is limited by several factors, including the high frequency of gadolinium (Gd) administration and difficulties in precisely registering serial MRI scans. In addition, it is difficult to image the spinal cord longitudinally. Given this situation, a CSF or blood test may provide an alternative or complementary option for monitoring MS disease activity over time. With regard to the prognostic value of blood NfL, the timing of longitudinal measurements is an important issue. Indeed, within 2 months after CIS, serum NfL does not seem to be dependent from the interval between CIS onset and blood sampling.40 On the contrary, 6 months after optic neuritis, CSF NfL shows a median decrease of 45% of its baseline values, but it is retained at higher levels in subjects with poorer visual outcomes. [S25] Therefore, while the first assessment of NfL can be performed at any time within 2 months after the first clinical event without expecting any significant variations in its levels, a second measurement 6 months later could have a more specific prognostic value. Another potential application of NfL could be in the monitoring of subjects with genetic risk factors for AD. Indeed, it has been demonstrated that serum NfL correlates with the estimated years to symptom onset in autosomal dominant AD mutation carriers (correlation coefficient=0.75, p<0.001 for serum NfL).45 This finding points to the possibility of evaluating the effects of drugs in subjects with preclinical AD in clinical trials. NfL measurement in biological fluids has been proposed for monitoring the therapeutic effect of drugs aimed at reducing axonal damage. In this respect, MS represents the ideal pathological condition, since several DMTs targeting immune-mediated CNS injury are available. CSF NfL is decreased in patients with RRMS and SPMS after 6 and 12 months of treatment with natalizumab,56 57 as well as in patients who switch to natalizumab from less effective treatments. [S32] A decrease in CSF NfL has been also observed in patients treated with alemtuzumab, cyclophosphamide, fingolimod, mitoxantrone and rituximab.58–60 In addition, in a randomised clinical trial, patients with RRMS treated with fingolimod showed a significant decrease in CSF NfL values after 12-month treatment compared with placebo. [S33] Similar results have been reported for the blood NfL values in patients treated with fingolimod for 12 months, [S34] as well as in patients treated with other drugs (interferon beta, glatiramer acetate, natalizumab and rituximab).2 Thus, blood NfL could be explored as potential indicator of the treatment effects of DMTs. Repeated lumbar punctures represent a significant obstacle to treatment monitoring, and therefore, blood NfL measurement may be a promising alternative to overcome this limitation. Since CSF NfL can detect axonal damage that has occurred in the last 3 months, [S7] it can be hypothesised that blood NfL measurement every 3 months might be useful to profile the ongoing axonal injury in patients with MS. Whether this could influence clinical management and decision-making should be further investigated by means of longitudinal studies at the individual level on blood NfL versus MRI measures. Over the last two decades, CSF and blood NfL have been shown to be reliable biomarkers of axonal damage across a variety of neurological disorders. Even though NfL changes in biofluids are not specific to any particular CNS disease, this biomarker may have diagnostic value and significant potential in terms of prognostic assessment and disease monitoring. With respect to its diagnostic potential, NfL might be useful for the diagnosis of ALS and for the early identification of presymptomatic ALS mutation carriers who are about to become symptomatic. In addition, NfL might serve for identifying a neurodegenerative process in patients with psychiatric manifestations and, hopefully, in individuals with subjective memory complaints. In these cases, once a neurodegenerative disorder is suspected, NfL, together with other disease-specific biomarkers (eg, CSF AD core biomarkers), might be especially beneficial for the differential diagnosis between FTD and AD and between prion diseases and rapidly progressive neurodegenerative dementias. Finally, NfL could help clinicians in the differential diagnosis between APDs and PD, in cases with overlapping clinical manifestations. Even though in MS and in TBI NfL per se does not have any specific diagnostic value, it might still be useful to determine its CSF or serum concentrations during the diagnostic workup and disease monitoring, since they provide clinicians with an overview of the severity of the ongoing axonal damage, which has important prognostic implications. As a prognostic marker indeed, NfL may have potential as a predictor of disease activity in patients with MS, thus potentially guiding clinicians in the choice of the best DMT, but also as a predictor of cognitive worsening in AD, FTD and PD and of motor worsening in patients with ALS and APDs. Although there may be many potential contexts of use of NfL, before it can be applied as a biomarker in the clinical setting, there are some steps that need to be undertaken in order to assess the analytical validity and the clinical validity and utility of NfL. One of the limitations to its use is the lack of standard reference materials and methods for NfL measurement both in CSF and blood. Standardisation efforts and round robin studies will allow for reliable comparison of results from different laboratories (Panel 3). In addition, normal values across age groups need to be established if NfL is to be used at the individual patient level (Panel 1). Thus, studies on large populations of healthy individuals are required to generate normative data. Blood NfL measurement represents an important opportunity to verify the effects of different therapeutic interventions on axonal integrity, especially in research settings and in clinical trials. Indeed, NfL could be used as an outcome measure, particularly in both proof-of-concept and dose-finding studies (eg, phase IIA and IIB studies), where the drug biological activity and the optimal dose for biological activity have to be demonstrated. Studies that focus on the association between longitudinal changes in blood NfL and relevant clinical and radiological measures in neurological diseases are therefore encouraged. CSF NfL has a clear positive association with age (r=0.77, p<0.0001), showing a twofold increase in 50-year-old and a sixfold increase in 80-year-old subjects versus 20-year-old subjects. [S48] Such a relationship is partly explained by axonal structural alterations and metabolic changes taking place along ageing. Accordingly, when testing potential clinical applications of either CSF or blood NfL, the effects of ageing should be taken into account. Multicentre studies on large populations of healthy individuals performed in qualified laboratories are needed in order to define CSF and blood NfL reference values according to age groups. ELISA. A sandwich ELISA technique, based on the binding of specific monoclonal antibodies to NfL, is commercially available since 2003 and the vast majority of the studies carried out on CSF NfL have used this assay. [S4] Although this ELISA shows high precision, further standardisation is needed. [S49, S50] In 2018, a new ELISA for CSF NfL has been developed and applied in a variety of neurological diseases, confirming the validity of CSF NfL as a biomarker. [S36] ELISA is mainly restricted to CSF because of its limited sensitivity to measure the small concentrations of NfL in blood. Simoa. Simoa technology is based on single-molecule arrays and simultaneous counting of singulated capture microbeads. [S51] Simoa kits are commercially available and results on plasma/serum NfL have been published from 2016 onwards. This technique has sharply increased the sensitivity for NfL measurement in blood and has allowed a reliable quantification in blood samples from young HCs.2 [S52] A strong correlation has been consistently found between blood NfL and CSF NfL, thus suggesting that blood NfL measurements with this technique may become a valid alternative to CSF analysis.2 7 [S9, S53] However, it would be ideal to further improve the assay precision in order to use it to detect small within-subject changes of blood NfL. The current assay version, indeed, has an analytical variation ranging from 5.6% to 6.9%.2 Therefore, it can detect group-level changes that are quite small and intraindividual changes exceeding its analytical variation. Certified reference methods and materials for global assay standardisation have to be developed to allow external calibration of the assays. This would increase the comparability of studies. Multicentre and round robin studies (ie, interlaboratory testing of the same samples with the same analytical methods) have to be performed in order to validate the available assays and to standardise the preanalytical and analytical procedures. It would be ideal to further improve the analytical precision of the assay for measuring blood NfL in order to use it at the individual level to longitudinally monitor small within-subject changes. Data on NfL at the individual level have to be obtained in different neurological diseases, in order to clarify how to interpret NfL changes in the single patient. The range of normal values in different age categories has to be defined for both CSF and blood NfL with multicentre studies on healthy individuals. In order to use NfL as an outcome measure in clinical trials, the correlations between NfL and currently used clinical outcomes have to be thoroughly investigated. Once verified, NfL may be used as a surrogate outcome in phase II clinical trials. Data on the correlation between NfL and clinical outcomes in different neurological disorders, followed up for a long period of time, are highly needed. References for this review were identified by searches of PubMed between 1990 and 31 January 2019, and references from relevant articles. The following search terms were used: ‘neurofilament light’, ‘neurofilament light chain’, ‘neurofilament light protein’, ‘NfL’; ‘cerebrospinal fluid’, ‘CSF’, ‘serum’, ‘plasma’, ‘blood’; ‘demyelinating diseases’, ‘multiple sclerosis’, ‘MS’, ‘clinically isolated syndrome’, ‘CIS’, ‘radiologically isolated syndrome’, ‘RIS’, ‘optic neuritis’, ‘myelitis’; ‘amyotrophic lateral sclerosis’, ‘ALS’, ‘motor neuron diseases’; ‘frontotemporal dementia’, ‘frontotemporal lobar degeneration’, ‘FTD’, ‘FTLD’, ‘primary progressive aphasia’, ‘PPA’, ‘Alzheimer’s disease’, ‘AD’, ‘mild cognitive impairment’, ‘MCI’, ‘dementia’, ‘Parkinson’s disease’, ‘PD’, ‘Parkinson’s disease dementia’, ‘PDD’, ‘dementia with Lewy body’, ‘DLB’, ‘progressive supranuclear palsy’, ‘PSP’, ‘multiple system atrophy’, ‘MSA’, ‘corticobasal syndrome’, ‘CBS’, ‘Huntington’s disease’, ‘HD’, ‘normal pressure hydrocephalus’, ‘NPH’, ‘HIV’, ‘AIDS’, ‘AIDS dementia complex’, ‘ADC’, ‘antiretroviral therapy’, ‘ART’, ‘Stroke’, ‘transient ischemic attack’, ‘hemorrhage’, ‘subarachnoid hemorrhage’, ‘SAH’, ‘intracerebral hemorrhage’, ‘cardiac arrest’, ‘resuscitation’, ‘autoimmune encephalitis’, ‘paraneoplastic encephalitis’. There were no language restrictions. The final reference list was generated based on relevance to the topics covered in this review. Additional references can be found in the online supplementary material.
. Cerebrospinal fluid in the differential diagnosis of Alzheimer’s disease: Clinical utility of an extended panel of biomarkers in a specialist cognitive clinic. Alzheimer’s Res Ther2018;10:1–11.
. Neurofilament light chain and tau concentrations are markedly increased in the serum of patients with sporadic Creutzfeldt-Jakob disease, and tau correlates with rate of disease progression. J Neurol Neurosurg Psychiatry2018.
. Neurofilament light chain in serum for the diagnosis of amyotrophic lateral sclerosis. J Neurol Neurosurg Psychiatry.
. Performance evaluation of a multiplex assay for simultaneous detection of four clinically relevant TBI biomarkers. J Neurotrauma2018:1–25. Contributors LG, LP, MDF and HZ made the literature search and drafted the manuscript. LG, MDF and LP prepared the figures and the tables. KB, PC, MDF, LP and HZ reviewed the manuscript. All the authors read and approved the final version of the manuscript. Competing interests LG received travel grants from Biogen-Idec, Biogen, Novartis, Teva, Genzyme and Almirall to attend national and international conferences. KB has served as a consultant or at advisory boards for Alzheon, BioArctic, Biogen, Eli Lilly, Fujirebio Europe, IBL International, Pfizer and Roche Diagnostics, and is a co-founder of Brain Biomarker Solutions in Gothenburg AB, a GU Ventures-based platform company at the University of Gothenburg. PC receives research support from Bayer Schering, Biogen-Dompé, Boehringer Ingelheim, Eisai, Lundbeck, Merck-Serono, Novartis, Sanofi-Aventis, Sigma-Tau and UCB Pharma. MDF participated to advisory boards of Biogen Idec, Teva and Bayer, received travel grants from Bayer Schering, Biogen-Dompé, Biogen-Idec, Merck-Serono, Novartis and Sanofi-Aventis to attend national and international conferences, and received speaker and writing honoraria from Biogen Idec, Novartis and Sanofi-Genzyme. HZ has served at advisory boards for Eli Lilly, Roche Diagnostics and Pharmasum Therapeutics, and is a co-founder of Brain Biomarker Solutions in Gothenburg AB, a GU Ventures-based platform company at the University of Gothenburg. LP reports no conflict of interest.